Great Ideas for Decorating a Baby Nursery Using Vintage and Picture Alphabet Cards. 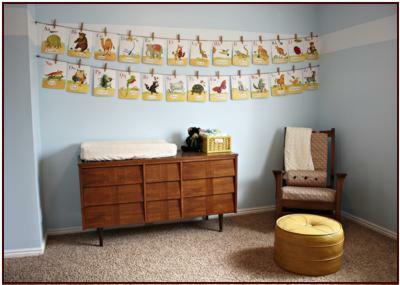 Nursery decorating using vintage alphabet cards or alphabet picture cards is becoming more and more popular. It's a frugal solution to help ease the burden on your baby nursery budget and it looks fabulous too. On this page I've pulled together several effective ways of decorating a baby nursery with alphabet cards. From a full-blown alphabet nursery theme to a simple collage, you'll find some great ideas below. 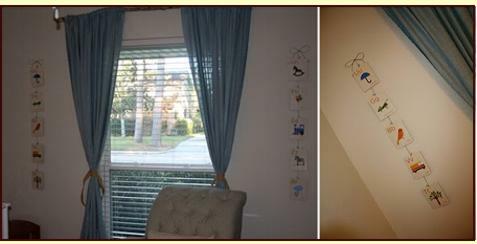 Create a focal wall by hanging your alphabet cards on a line right across the wall. Depending on the size of the cards you may need two lines, one below the other. Attach the alphabet letters to the line with pegs. You can make baby nursery pegs decorated to match your nursery decor if you want to. Framing your alphabet cards and hanging them on the wall is a simple and effective way of decorating a baby nursery. You can use the same type of frame for each letter and hang them around the room like a border, or you can use different frames with different sizes and create a photo wall. To create an effective photo wall it's best to paste the alphabet cards onto different colored backgrounds that complement your baby nursery colors before you frame them. You can use the whole alphabet or just a few letters with pictures that you like the best. This is one of the simplest nursery decorating ideas for alphabet letters. Simply stick them on the wall to form a block. You can jazz this nursery decorating idea up a bit by sticking the alphabet letters to a large piece of stiff cardstock and framing the whole thing. Use your alphabet letters as an alternative to nursery wall letters to spell you baby's name. If you can find nice big ones you can frame them or hang them from a line as described above. If your alphabet cards are small they are perfect for decorating a baby nursery door. Just stick them on the outside of the door or hang them on a line vertically (one below the other) - see below. Alphabet cards make a wonderful and simple baby nursery border. Because they are small you can also use them to create a border around a large mirror or wall hanging. Paint another wall with a mural of alphabet blocks in a line or a tower or tumbling over the floor. Include teddy bears in the nursery mural to make it fun. 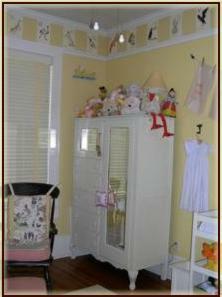 Use wooden letters painted in your nursery colors as drawer pulls, curtain tiebacks and doorknobs. Hang painted wooden alphabet letters from the ceiling for your baby to look at while he lies in the baby crib. Make your own nursery mobile using wooden letters or stuffed fabric ones. Add some alphabet baby bedding or cushions with letters of the alphabet embroidered or sewn on them. If you can find a good set of vintage alphabet cards you can base an entire vintage nursery decor design around them. Do you have a great idea for using alphabet cards in the baby nursery? Share your ideas for decorating a baby nursery with alphabet cards with us here!